Could Fido Void Your Home Insurance? > Could Fido Void Your Home Insurance? Dog owners should read their home insurance policy's fine print. Not all companies will insure a property that is home to certain types of dogs. In April, Quebec tabled legislation to ban certain dogs in the province. The dogs to be banned include: pit bulls (including American pit bull terriers, American Staffordshire terriers and Staffordshire bull terriers); Rottweilers; dogs that are part-pit bull or part-Rottweiler; and dogs that have been crossed with other animals like a wolf, coyote or fox. 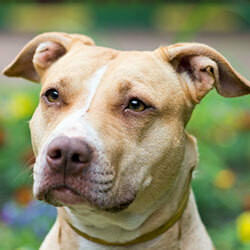 Ontario implemented a similar ban, on pit bulls, in 2005. Once the Quebec legislation comes into force, Quebec and Ontario will be the only two provinces in Canada with a province-wide ban on certain breeds of dogs. Could this ban affect your home insurance coverage? Potentially, because owning certain breeds of dogs may give some home insurance providers reason to pause. But, the fact is this is also true in provinces where there is no ban in place. The reason being, if your dog bites or attacks someone, your home insurance policy would typically protect you from a lawsuit. This is why, if you are a dog owner—of any type of dog—it's best to ensure that the company you have your home insurance through knows about your four-legged family member. Call your provider to ensure you (and Fido) are protected, because while some insurers don't care about the breed of your dog, others do. And it's better to know now whether or not you're covered because if the worst happens the outcome could be costly. One Canadian insurer estimated in 2013 (the last time the details were released),the average dog bite claim came in at just over $30,000; down considerably from the previous year (2012) when dog bite claims averaged almost $73,000. If it turns out your insurance company excludes coverage because of the type of dog you own, then shop around for a home insurance policy that provides you with the personal liability coverage you need. Dogs that have been spayed or neutered tend to be less aggressive and are less likely to bite. It's important for your dog to meet, greet and interact with a variety of people, animals, and places at a young age so it doesn't feel threatened in strange situations. Early on, take your dog to training and obedience classes. These classes teach pet parents how to train and control their dogs, while the dogs learn how to behave and interact properly. Dogs are social beings and spending time with your dog is important. Play and interact with your dog regularly and provide lots of chew toys and balls for games. But, avoid aggressive games like tug-of-war or wrestling, because your dog won't always understand the difference between play and real-life situations. Walk and exercise your dog regularly, feed him an appropriate diet, and take him to a vet at least annually for a checkup. A healthy dog, that isn't ill or in pain, is less likely to bite. Never leave a child younger than 10-years-old alone with a dog—even the trusted family pet. Owning a dog, any type of dog, is a significant responsibility, and for many homeowners it comes as a surprise that having a dog could also increase their personal liability. And, since there is no way to truly guarantee your dog won't hurt someone, it's best to talk to your home insurer to ensure you're covered.